The newest collection of Manopoulos backgammon sets is here! The GammonVillage design team, in collaboration with the esteemed craftsmen from Manopoulos, have created a dazzling array of one-of-a-kind wood backgammon sets, available exclusively from GammonVillage. This medium walnut backgammon set features a meticulously inlaid oak playing field, with red poplar inlay for point 1, and walnut inlay for point 2. The case trim and checker trays are finished in solid walnut. The new upgraded latches are durable, attractive, and easy to open/close. The exotic wood veneers have all been hand-selected, with careful attention to color detail and checker co-ordination. The end result, as you can see, is nothing short of spectacular. That's the GammonVillage design team, working for you. 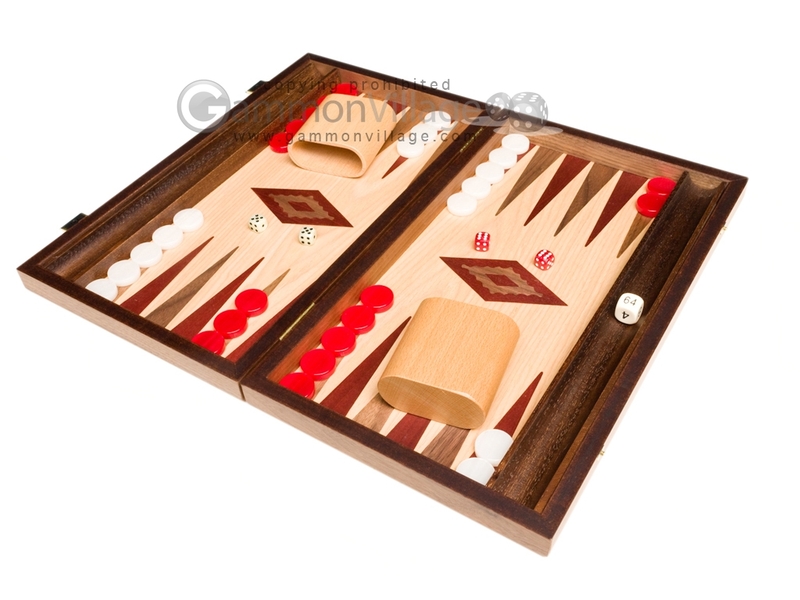 Classic, elegant, and stylish, Manopoulos wood backgammon sets are an unbeatable combination of quality and value. Each set comes fully equipped with wood dice cups, luxurious marbleized checkers, dice, and doubling cube. Closed Length: 15" Width: 9" Height: 2 1/8"
Open Length: 15" Width: 18" Height: 1 1/16"
Cup Height: 3" Width: 1 1/2" Length: 2 7/8"
Page P5214 Copyright © 1999-2019 GammonVillage Inc., USA. All rights reserved.